Editor: Please go to the original article, re-posted here below, for our the wonderful links (that I didn’t have time to install) plus it will show our good friends at Two Cathedrals how many of our readers enjoy their stuff. Summer’s here and you’re thirsty! Parched, you walk in to your local convenience or grocery store and buy a bottle of water, a plastic bottle. Right then, you seal your fate. You’re going to plastics hell, where you’ll hear the sound of baby dolphins crying and watch images of struggling sea turtles for all of eternity. OK, maybe not. But perhaps you should think twice nonetheless. 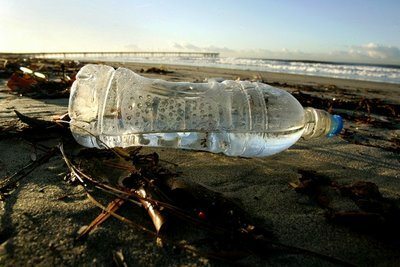 Today [June 29, 2011]is Rise Above Plastics day, a perfect occasion to remember that we should strive to reduce our plastic consumption all year. One easy way to embark on your journey through plastic purgatory is to start small: with water bottles. If the Mayor of San Diego can make the City do it, surely you can curb your consumption of this expensive luxury item. Really, bottled water isn’t all it’s cracked up to be. It’s not necessarily cleaner, and in fact, it’s less regulated than tap water. Yes, your tap water is probably safer to drink than an overpriced bottle of water. And yet, people wind up spending up to 10,000 times more on bottled water than we would have paid for tap water. Which translates to about $100 billion for our corporate friends. Privatization of this public resource is bad for all of us, but especially developing and third-world countries. Many private water bottling companies exploit these areas, ironically only to pollute the local drinking water supply in the process. Oh, and it’s happening in the USA too. So why are we so willing to throw our money away? Have we reached the point where laziness and irresponsibility converge to justify paying an exorbitant price for the convenience of walking around free from the great hindrance of a metal canteen that weighs mere ounces? Do we not trust the government to get it right? Well then stop sipping on that cancer cylinder too because 40 percent of bottled water is taken from tap water sources. You also won’t find this type of disclosure on your bottle of spring water. If you’re still unconvinced about the quality of the liquid gold flowing from your municipal tap (or perhaps it’s not tasty enough for your discerning palate) you can just buy a filter. We need to stop thinking of bottled water as a healthy alternative to tap water, or a convenient way to stay hydrated. It’s a luxury at the expense of not only the environment, but people worldwide. This summer, when you reach for the bottle, make it a reusable one filled with good old San Diego tap water…and keep the baby dolphins from crying. Livia Borak is an attorney at Coast Law Group, LLP in Encinitas where she focuses on a variety of environmental issues representing various non-profit organizations. She’s a former San Diego Coastkeeper staff attorney. Remember, go here for the original article. Newer Article: We Don’t Need More Stuff; We Need a Different Way of Distributing the Stuff We Have.